As previous discussed, many people shy away from collecting Silver wares because they were scared of Silver tarnish. The truth is Tarnish is not as scary as what many may think. It may be much simpler than many has thought. Dusting - First, use a soft-bristled brush or clean cotton cloth to dust the piece. While this may seem unnecessary, it's important since dust can easily turn into an abrasive and scratch the finish if not removed before applying cleaning solutions and make it effort to avoid it. Applying the Polish - Apply the polish in a gentle manner. Avoid circular motion, as this can cause a hole in your precious Silver. Always polish in one direction (lengthwise), not crosswise. For intricate areas, use a cotton-tipped bud or a toothbrush. Rinsing: Make sure all polish is removed when you're finished, using additional cotton-tipped bud or a toothbrush. Once the piece looks clean and shiny, stop polishing even if you're still seeing dark residue on your cloth. Dry with a lint-free cloth. Always dry your silverware before putting it away. Do not allow it to air dry. Air dry can cause unattractive water marks on the Silver. Hand polishing is best (with a slightly damp, clean cloth). 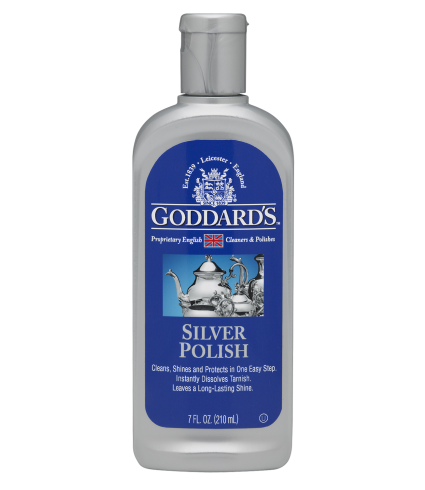 I personally prefer Goddards Silver Polish Foam and Goddards Silver Polish. I use it for quick and removing simple tarnish. This is fairly simple to use. Simple dip a little of the polish foam on a wet sponge (A small wet sponge is include inside the packaging), and lightly rub off tarnish, yellowish or dull surface. The Silver piece immediately gives a shine. Also it contains certain anti-tarnish agent. Keep your polish containers tightly closed and store at normal room temperatures and do not use polishes that have dried out. Dried out polish will become more abrasive as the liquid use to suspend the polishing ingredients are reduced or gone and will harm your silver, especially silver plate. I use it for more stubborn tarnish. Simple pour lightly on a damp cloth. Lightly rub off the tarnish. Again avoid circular motion. it contains certain anti-tarnish agent and can make a weak spot on the silver piece. On pieces that are heavily chased or with repousse, the tarnish that is so difficult to get out of the low spots should actually be left. It serves as a deliberate contrast to the high spots which should be free from tarnish, displaying the varying elevations of the piece to best advantage. Silver-Dip can leave a white surface, remove the patina, and make the surface hyper-active accelerating future tarnish. When moving an item, use two hands around the body of the object and do not pick up by the handles, which could be weakened with age and use. 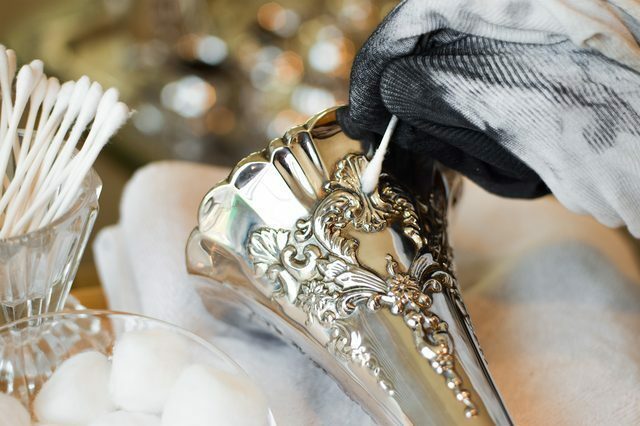 Excessively polishing silver can wear down the finish, so take care not to overdo it!